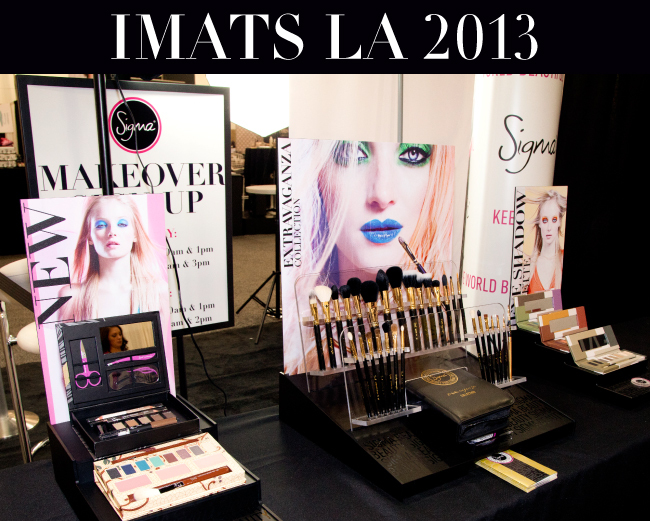 Sigma Beauty Affiliate Program: Sigma at IMATS LA 2013! Sigma at IMATS LA 2013! It’s that time of year again! We will be at the Los Angeles International Makeup Artists Trade Show, better known as IMATS, on January 19 and 20! Last year we expanded our booth and sold our most popular products (with a 15% off discount). This year, our booth (#600) will be even bigger and have more products for you to purchase at 20% off! Beauty experts Tiffany D and Makeup by Camila will also be at the Sigma booth providing makeovers to some lucky attendants. Annie (Affiliate Program Manager) and Kristina (Affiliate Program Coordinator) will be there on behalf of the Affiliate Program, so make sure to stop by the booth and introduce yourself! Check out the pictures and video below from IMATS LA 2012! The Sigma booth featured product displays, which offered an interactive experience for guests to see, touch, and test our brushes and makeup. We also handed out free gift bags to everyone who visited our booth! We sold a number of our best-selling items, including the Make Me Essential Kits, to IMATS guests. This year we are expanding our product list to include individual brushes and new products (visit the Sigma Beauty Blog on Monday for the complete list)! One of the highlights of the Sigma booth was having YouTube gurus MakeupbyTiffanyD and MakeupbyCamila providing makeovers to IMATS visitors! They will both be back again this year, so stop by the booth to see them in action! Check out our video from IMATA LA 2012! Will you be attending IMATS LA 2013? It’s a great opportunity to get acquainted with the brand and purchase the Sigma products on your wish-list! I'm sad, I'll be attending IMATS New York because it's my sixteenth birthday :( Why can't you guys come to New York? i wish i could be in there so badly... i probably would buy the whole booth! Hi Nikki! The discount will only be available at the IMATS event. We are Brazilian Fashion Bloggers living in San Diego and would love to attend the IMATS LA on Sunday! Do you think Sigma Beauty can get us 2 credentials since we are Sigma affiliated? Hi Paula and Pat! At this time we are unable to provide complimentary tickets to IMATS LA.Please make sure to visit our booth if you are able to attend!